Product information "Crown Major Pendant Light"
The Crown Major pendant lamp arose from the collaboration of the Italian manufacturer Nemo with the design team Jehs + Laub. The first draft of the Crown lights following is now the opulent and truly "royal" Major Crown. 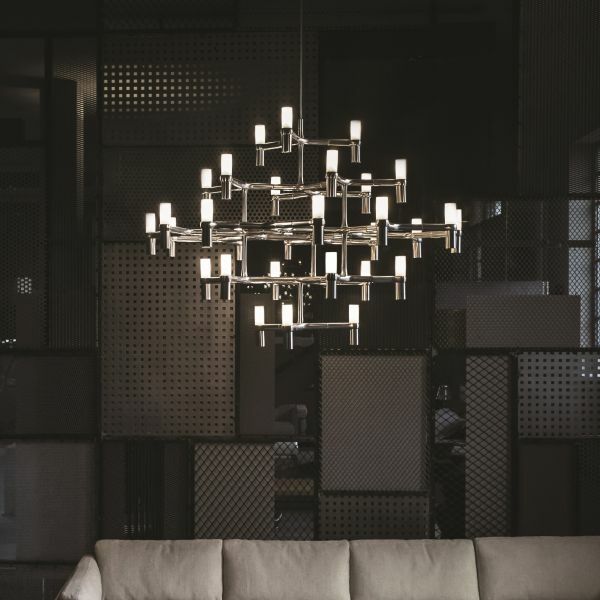 To a modern chandelier reminiscent, the pendant lamp hangs despite their size gracefully in the air. This is due to the used material aluminum die- casting, which is both stable and easy. On 5 superimposed levels a total of 30 Halogen ECO bulbs are distributed which, thanks to the sandblasted diffuser glasses, issued a diffuse and glare-free light. The Crown Major pendant lamp is perfect over the dining table. Related links to "Crown Major Pendant Light"